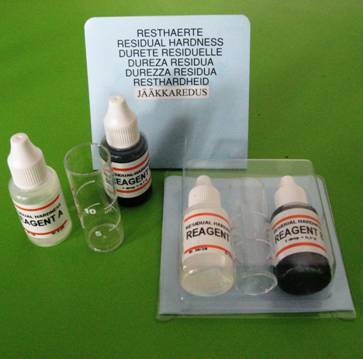 The determination of residual water hardness of softened water is simple, fast and accurate. Mostly used in boilerhouse boilers, particularly in steam boilers to check incoming water residual water hardness. Take 5ml of water into the test tube. Add 1 drop of Reagent A, a buffer solution and mix. Then add drop by drop indicator Reagent B and mix after every drop until the color changes from red to green. Count every drop. The residual hardness is determined by the number of drops used. For example, 4 drops = residual hardness 0.4 GH. The kit allows to analyse the roughness by 0.05 GH accuracy. For this take 10 ml of test water, to which add additional 2 drops of buffer solution and repeat the described procedure. One indicator drop corresponds to residual hardness of 0.05 GH. For example, 7 drops = 0.35 residual hardness GH.